Over the past decade more and more scientists have realised the importance of getting out of the lab, explaining science to the public and presenting the very human face of science. Now, in a single move, the British Home Office has potentially undone some of this good work. In a revamp of their anti-drugs campaign the Home Office has elected to use the image of a ’crazy chemist’ as a warning to the dangers of so-called ’legal highs.’ Promotional material bearing this image will be given to the half a million students beginning university this term. With the Home Office website featuring comments such as ’featuring an eye catching and menacing scientist, the campaign conveys the unscrupulous nature of people who create and sell substances’ this is campaign is hardly endearing itself to science professionals. 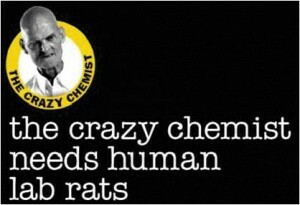 The ’crazy chemist’ campaign has raised the ire of the Royal Society of Chemistry (RSC) who have criticised it for the use of a “lazy stereotype of the chemist as an unhinged scientist” and has called for the promotional material to be withdrawn. A spokesperson for the RSC, Jim Iley, stated that “chemists in the UK and elsewhere invest significant amounts of time to use chemistry to solve health-related issue and, consequently, improving people’s lives. More on the ’crazy chemist’ campaign can be found on the BBC and RSC websites. Sigh. What were they thinking?